You know what I love? Banana bread. You know what I don't love? Taking pictures of banana bread. Doesn't it look like I've just sliced a brick in to pieces? Sigh. 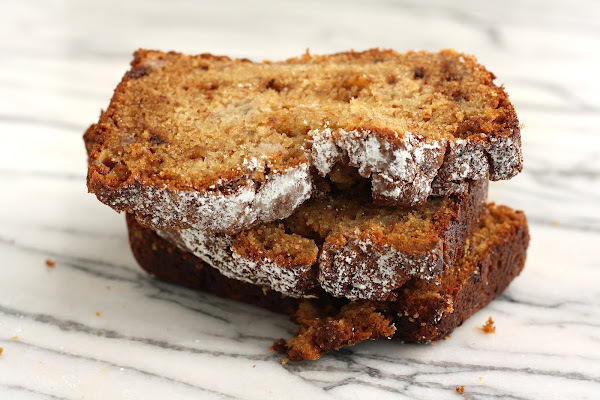 But believe me when I say that this is one of the best banana bread recipes I've found. 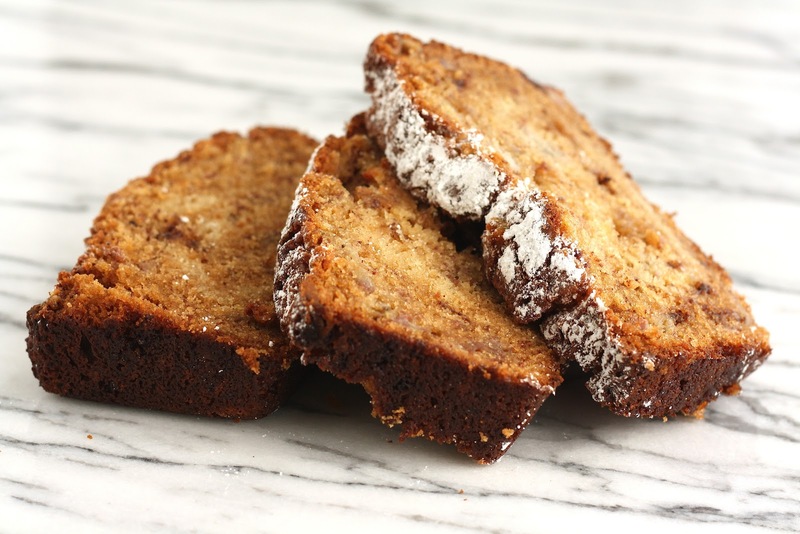 The flavors blend perfectly together, and the ingredients are carefully combine to create the softest, moistest banana bread ever. I often find loaves have a tendency to turn out too dry, but not this recipe. Nope. So despite the crappy photos, promise to believe me when I say: make this banana bread. It's one of the best banana recipes I've found. Seriously. 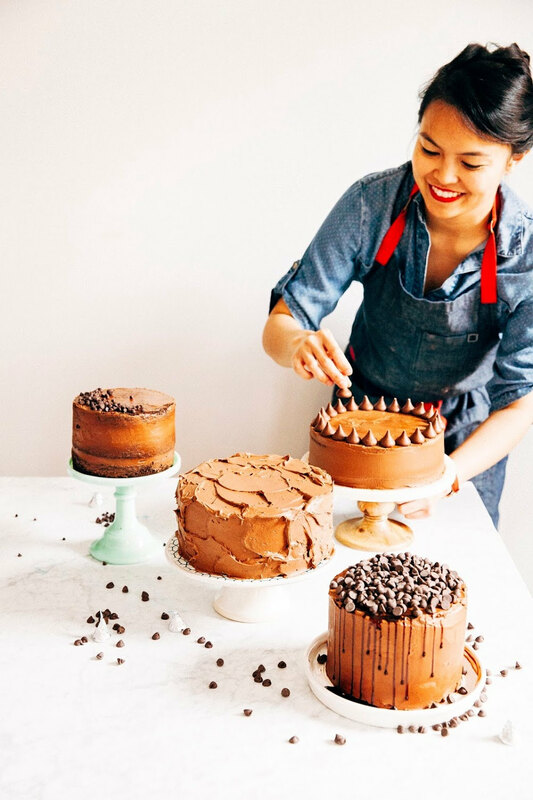 In a medium bowl, whisk together 2 cups flour, 1/4 teaspoon baking powder, 3/4 teaspoon baking soda, 1/4 teaspoon cinnamon, and a dash of salt. Set aside. In the bowl of a freestanding mixer with a paddle attachment, cream together 1/2 cup butter and 1 1/2 cups sugar. Add 1/4 cup sour cream, beating until just incorporated, and then add the flour mixture (from the second step) and beat until just incorporated. Use a rubber spatula to mix in 3 bananas, 1/3 cup caramel syrup, and 1/2 cup toffee chips. Stir until just incorporated. 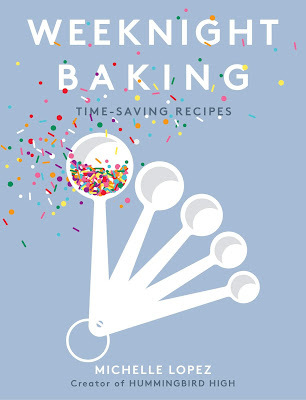 Pour the batter into greased loaf pan and bake for approximately 60 minutes, or until a toothpick inserted into the center comes out clean. I feel you on this. Some food just isn't attractive...but it sure sounds delish! Hahha yep. Banana bread, soups, stew... but yum. Is there a specific recipe for the caramel syrup or just use a standard recipe? I just used Trader Joe's caramel syrup for the recipe, but I'm willing to be that a homemade caramel syrup would make this recipe even more amazing! Aw thanks! I'm a little embarrassed since they're not my best pictures, but the recipe is so good that I had to share them anyway. It both looks and sounds delicious! 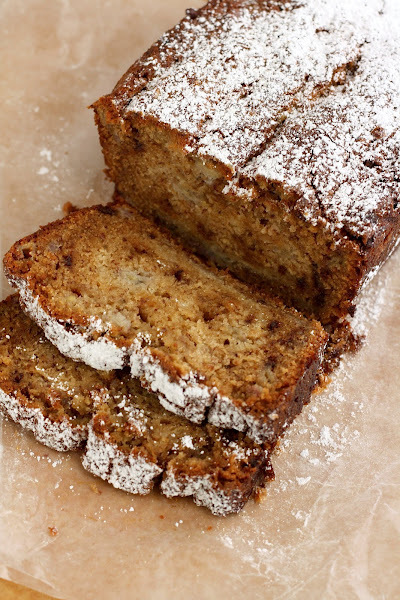 I love banana bread, whether it's the classic recipe or a jazzed up one like this. Yum. If I'm going to buy toffee pieces right now this is exactly what I'm going to bake. This is perfect for thanksgiving dinner! I've always been intimidated by the prospect of making banana bread. This really put me at ease. I thought the toffee pieces might be over powering but they melded so well with the bread. Delish!